The National Disability Insurance Scheme (NDIS) is changing the way people with disabilities get the support they need. It is designed to give people more choice and control about the services they require and who supplies them. 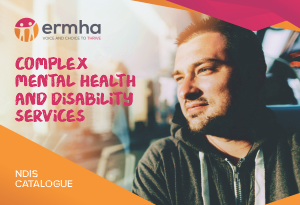 Ermha is a registered NDIS support provider and specialises in providing support to people with Mental illness, psychiatric disability and mental disorders. Who is eligible for NDIS support? What will the NDIS pay for? The NDIS will pay for fair and reasonable supports and necessary supports. NDIS planners will meet with you to create a support plan that will enable you to live better in your community. It does not include day-to-day living costs that are not related to a participant’s disability support needs. Is Ermha an NDIS support provider? Yes, Ermha has been a registered support provider under the NDIS since July 2013, and we meet all applicable quality standards. What kind of support does Ermha provide? Can I choose who provides support to me? Yes. You can choose providers that are registered with the NDIS. If you are self-managing your funds you can buy services from non-registered providers. I think I'm eligible for NDIS funding. What should I do? To meet the NDIS disability rules you need to have a disability that is likely to be permanent (lifelong) and that stops you from doing everyday things by yourself. It will be useful to think about what you want to achieve with the support provided in your NDIS plan. You can also order a free Ermha Information Pack using the form at right. When will the NDIS come to my area? What if need support from more than one provider? Some people will require support from a single provider. Others will require support from multiple agencies. For example, Ermha is the sole provider for many people and we also work with people who use two or more providers. Ermha NDIS specialists are ready to assist you. Fill in the form below and we'll take it from there. Please note: Your information will be treated as strictly confidential.